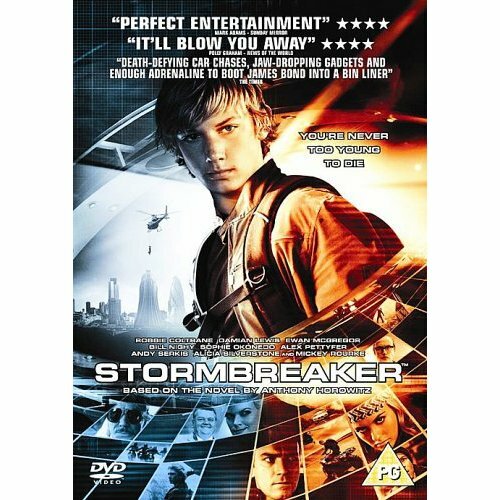 The movie version of Anthony Horowitz’s first Alex Rider novel, Stormbreaker, hits Region 2 DVD in the UK this week. Which gives me an excuse to talk about this movie. Stormbreaker actually got a legitimate release in England, so they’re making a big deal out of the DVD. Here in the US, it was horribly mishandled by The Weinstein Company, and barely saw any kind of release at all. After two amazing international trailers, which appropriately played up the action in Horowitz’s young spy saga, the eventual US trailer instead played up the jokes, dubbed a couple of the British actors, and tried to look a lot more like a kids’ movie. Worse still, the American poster was a truly hideous thing, with the horrible tag line "Rule the school. Save the world." (Ruling the school has absolutely nothing to do with either book or movie.) It changed the title to the unwieldy Alex Rider: Operation Stormbreaker, despite the fact that the book was a bestseller under its own title. And it sold the movie as an Agent Cody Banks clone. Now, one of the primary selling points of Horowitz’s series is that he doesn’t talk down to his young readers. Yes, they are kids’ books ("young adult," actually), but they aren’t the Bobsey Twins. They feature a young hero, but they have death and violence and suspense. They’re written for young teenagers, and they’re books that a middle-schooler can feel cool reading. They feature a hero the same age as the target audience. Agent Cody Banks was a movie aimed at much younger kids, featuring a kid hero slightly older than them. Stormbreaker is a legitimate action movie that teenage boys would actually enjoy; Cody Banks is a joke. What I’m saying is, it was a terrible mistake to label this movie as something it isn’t. The Weinstein Company had a much cooler property on their hands than they realized. They may be a bigger phenomenon in Britain, but the books are New York Times bestsellers over here! They had a built-in audience and they didn’t even use it! Other than the horrible poster, the movie was not marketed at all in the US. No TV spots, no print ads (that I saw, anyway), nothing. The release date was changed twice, and when it finally dribbled out in the box office dead zone of early October, it was only to a very few theaters. I saw it with my girlfriend in one of only two it played at in the Los Angeles area (and LA is a fairly large market), and there were four other people in the theater. If kids who read the books somehow realized the movie existed and wanted to see it, they probably couldn’t find it. The one place it was actually marketed was in bookstores, and that was by the publisher, not the film company. In Borders at that time you could find front-of-store displays full of Alex Rider books, including a making-of the movie book, the published screenplay by Horowitz, the movie tie-in edition of the novel, and a comic book adaptation of the movie. But the movie itself was nowhere to be found. Perhaps it will find its market on DVD here in the US, whenever it comes out, but I doubt it. I hear rumors that TWC is planning to release it exclusively at Walmart. Which means it will actually get a lot of shelf space at America’s largest retailer... but none whatsoever at all the others. It’s all too bad because the movie itself isn’t bad. It’s better than a lot of dreck that got legitimate theatrical runs this year. It doesn’t quite live up to the full potential of an Alex Rider movie, but the kid in the lead does a good job and the supporting cast is made up entirely of wonderful, mostly British, actors, like Ewan McGregor, Stephen Fry, Bill Nighy and Andy Serkis. All do predictably good jobs. I hope this British DVD performs wonderfully. It will have to if there’s any hope of seeing a sequel, since Stormbreaker never had a chance in the crucial American market. And the best books in the series are yet to come, so a sequel would be good news.